Hybrid power is in a weird in-between state at the moment. On one side of the equation, you have insane spaceship-esque performance cars like the McLaren P1, Ferrari LaFerrari, and Porsche 918 Spyder. 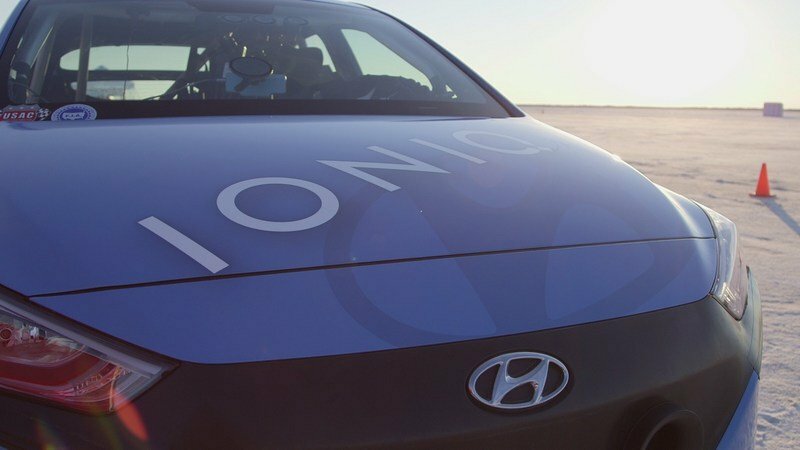 On the other side, you have calm, cool, collected commuter-mobiles like the Hyundai Ioniq. The question is how do you bridge these two philosophies? 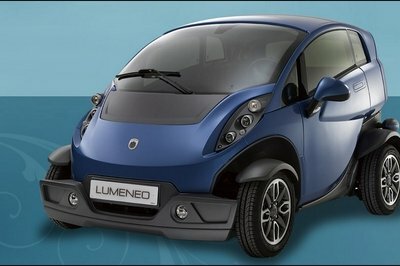 Both pair electrification with internal combustion, but the gulf between them seems impassable. 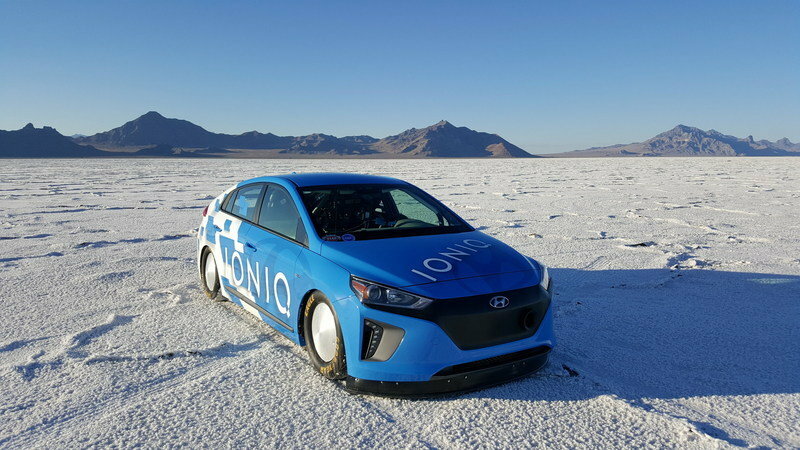 Luckily, Hyundai is on the case, having set a new land speed record by going 157.825 mph in a specially modified Ioniq four-door. 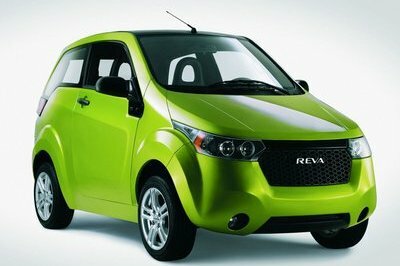 The effort was spearheaded by Hyundai Motor America’s Engineering and Quality Team (U.S.A.! U.S.A.! ), which was so impressed with the car’s overall quality when it was first received, it decided to go for a land speed record. 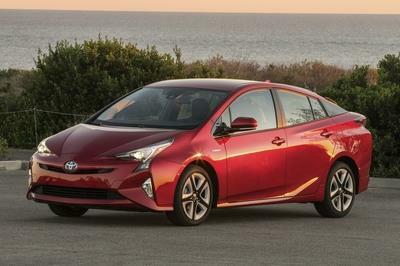 The official record set was for production-based hybrid vehicles, as approved by the FIA. And although the official record is just under 158 mph, the race car actually peaked out at 160.7 mph. 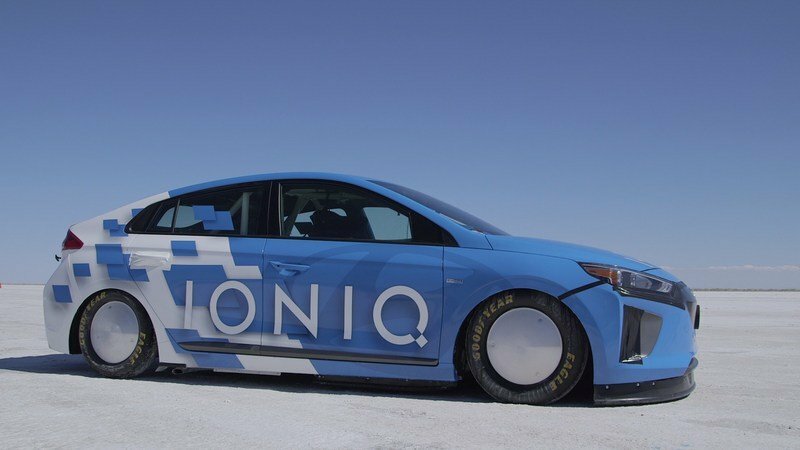 So what’s it take to get an Ioniq going that fast? Read on for the details. 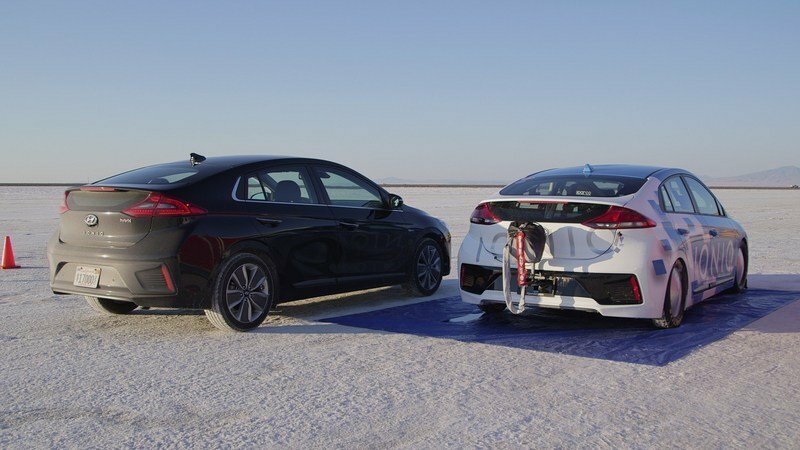 In case you were unaware, the Bonneville Salt Flats is best characterized as a nexus of speed and power, recognized by gear heads the world over as the battleground for the ultimate in top end bragging rights. Last year, heavy summer rains washed out several of the big events, but this year, the salt is looking prime for v-max runs. 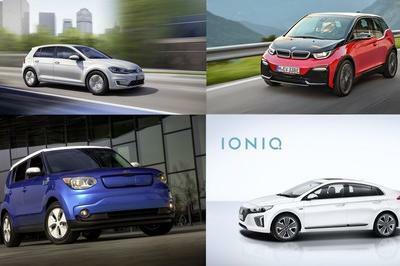 Enter the speed record Ioniq. 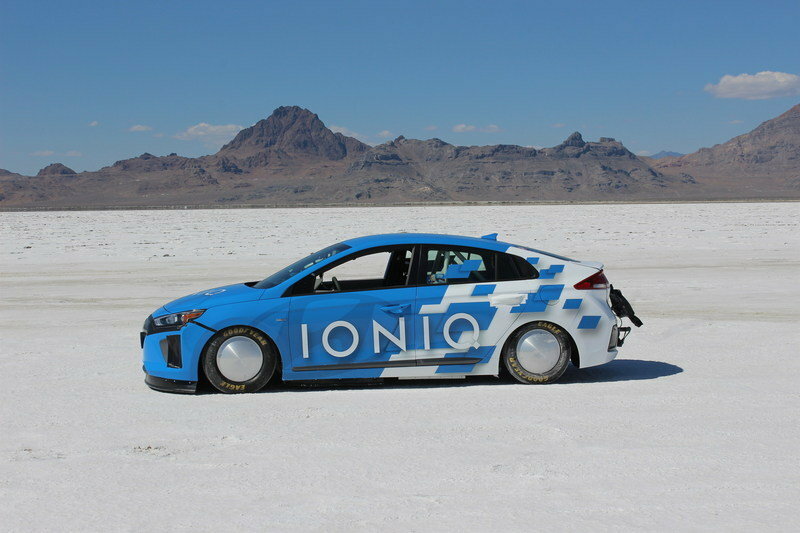 Based on the production Prius-fighter first introduced in the U.S. earlier this year at the New York International Auto Show, the Ioniq gets a 1.6-liter dino-juice burning four-cylinder engine, which mates to a 32-kW electric motor juiced by a lithium-ion polymer battery. From the factory, total output of the set-up comes in at 139 horsepower and 195 pound-feet of torque, all of which is sent to the front axle by way of a six-speed dual-clutch transmission. Hyundai declined to mention how big the shot is, but my guess is it came from one of the big bottles. It’s enough hit the 60 mph benchmark in about 10 seconds, with top speed rated at a rather lackluster 115 mph. Definitely nothing record-worthy, if you ask us. To catapult the modified racer into the record books, the Hyundai team dived headfirst into the powertrain, first replacing the intake and exhaust with high-flow pipes at both ends. 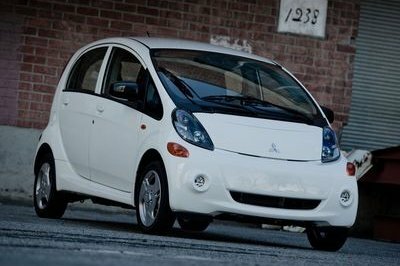 Next, the engine, transmission, and hybrid ECU were retuned to deliver maximum thrust, as opposed to maximum mileage. The speed governor was removed (obviously), as was the climate control equipment and all unnecessary ancillary components. All sensible stuff when building a racer. 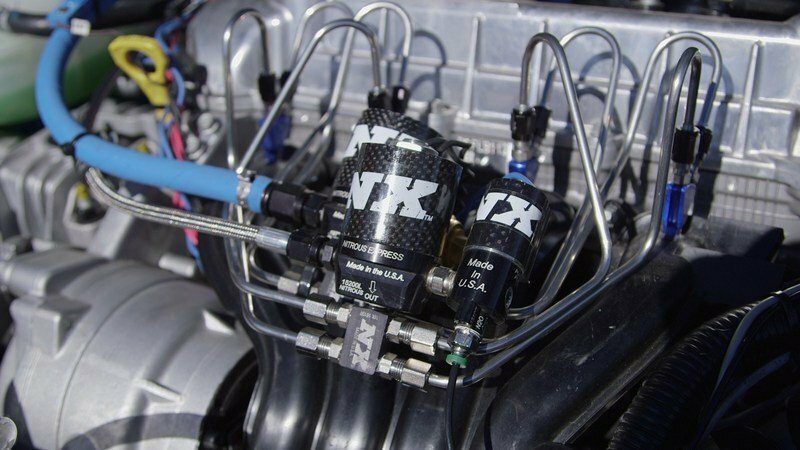 But the biggest upgrade was the single-stage direct-port nitrous injection system from Nitrous Express, paired with a stand-alone fuel system. To complement the newfound power, Hyundai modified the exterior styling for max aero efficiency, with a new grille and rear valence from the Ioniq Electric model, plus mods to the underbody and air dam. But considering how slippery the package is from the factory, my guess is this top speed racer didn’t need too much massaging to get into shape. The interior was gutted, and a roll cage from Bisimoto was added, along with a six-point racing harness, racing seat, and additional safety gear. Coilover suspension was added in the corners, courtesy of Progress Competition, while the sway bars were optimized to help the car run straight and true. The ride height was also lowered by 100 mm (3.9 inches). Lightweight wheels wrapped in Goodyear Eagle rubber were added, and a deployable parachute was mounted on the tail. It’s a brilliant little package, and the Hyundai team has every right to be proud of the new record. But you know what this means, right? Hey Toyota, you gonna take this lying down?